I stopped in State Line Liquors the other day and noticed all the fall seasonals that are coming in. A six pack of Tumbler and a few other singles jumped into the cart. So it looks like the next few reviews will be some fall seasonal beers. I’m not sure if this is a seasonal but it jumped into the cart with the others. The beer pours a clear dark amber with orange hues and a fairly rich off white to tan head. The nose is nice with sweet malt aromas with notes of toasty caramel. 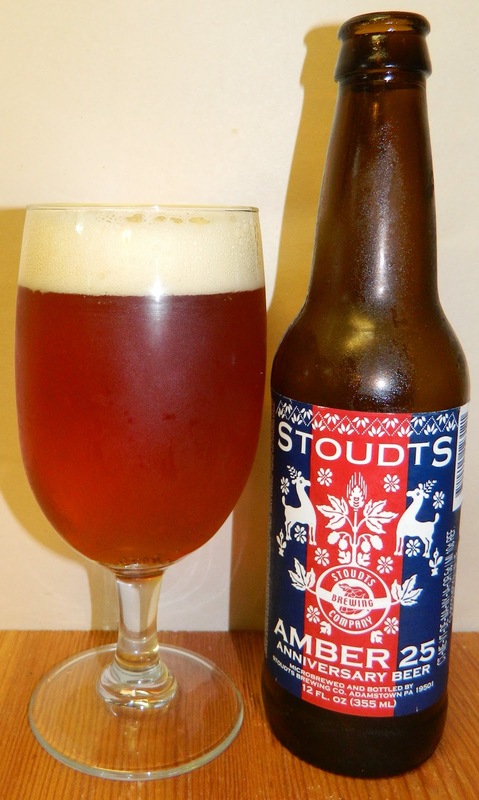 There is also a nice earthiness on the nose along with some floral hop aromas. What a nice, light, refreshing but somewhat hardy first sip. The experience starts out with a touch of malt sweetness up front followed by a cleansing effervescence as this ale washes over the tongue in the middle of the sip. The back-end is fairly easy drinking with an almost effortless swallow. There is an additional carbonation release during the swallow that masks some flavors and adds a refreshing aspect to the experience. The finish is very nice with pale and caramel malt flavors along with a unique earthiness followed by a clean hop bite without the bitterness. The final aftertaste is just a hint of this earthiness and caramel malt flavors. This is a very nice Amber Ale. It is clean and refreshing with good pale and caramel malt flavors with a light hop bite and unique earthiness that I assume if from the yeast. 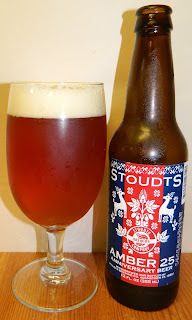 A | Stoudts Amber 25 is a very unique American Amber Ale with nice pale and caramel malt flavors, a smooth, light and refreshing mouthfeel, finishing with an earthiness and light floral hop bite. What a great American Amber!